PSG, OpMet, SORP, and SOOS are collaborating with the WMO’s Polar Prediction Project to establish the Year of Polar Prediction in the Southern Hemisphere (YOPP-SH). There was a major planning meeting held at the National Center for Atmospheric Research in Boulder, Colorado, USA in June 2017, and was targeted at entraining the oceanographic community into YOPP-SH. ASPeCt scientists organized and participated in the IGS International Symposium on The Cryosphere in a Changing Climate, held in February 2017 in New Zealand. FRISP: Organized two international workshops in Sweden and Norway. 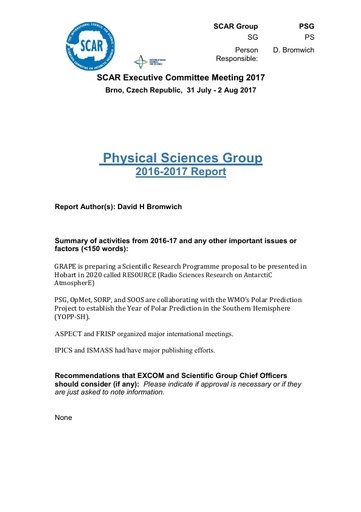 IPICS: Publication of joint special issue in Climate of the Past and Cryosphere resulting from the Second IPICS Open Science Conference (7-11 March, 2016, Hobart) that had significant funding from PSG in previous budgets. ISMASS is preparing a review paper on the contributions of the Antarctic and Greenland ice sheets to future sea level under a 1.5°C warmer world for consideration by IPCC.